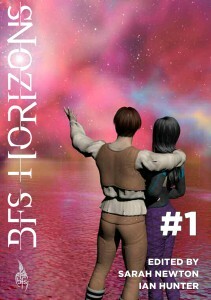 The first issue of BFS Horizons, our new magazine dedicated to fiction and poetry, should be off to the printers very soon. The editor is Sarah Newton, the poetry editor is Ian Hunter. Short stories in this issue include “The Feast” by L.P. Lee, “The Clockwatcher” by Sarah Newton, “The Seed” by David Ryan and “Inside” by Sandra Unerman, plus the winners of the BFS Short Story Competition 2014, accompanied by comments from the competition’s organiser and judge, Allen Ashley: “The Mine Field” by Jane Fox, “Be Careful What You Wish For” by Nikki Pratt, and “The Fenchurch Reckonings” by Jean Levy. This is a members-only publication, but we order a few extra copies for new members, and the monthly bulletin we currently produce contains download links for back issues where available, so it’s not too late: you can join the society here.